In approximately eight months of construction time, VKK STANDARDKESSEL built the biomass thermal power plant in Sellessen near Spremberg in the state of Brandenburg for Vattenfall Europe AG. The official inauguration of the plant, which cost EUR 11 m, took place on 13/04/2006. The boiler structure from water-tube and smoke-tube heating surfaces and the water-cooled reciprocating grate are designed for operation with wood chips. The fuel from holm, limb wood and rootwood with a water content of 20-55% is provided from open-pit mine perimeters and forests. In designing the combustion space, including the division and the injection of the individual primary and secondary air streams, CFD simulations were used to optimise combustion. of 3.5 MW that supplies the resettled locality of Haidemühl with local heat via a 15 km branched network. 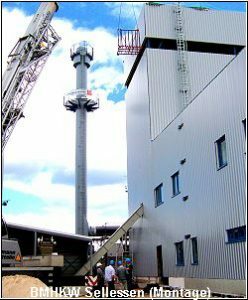 The plant fulfils all the requirements of the Technical Instructions on Air Quality Control and of noise protection without any problem and is equipped with state-of-the-art operating and surveillance technology. With this plant, VKK STANDARDKESSEL underscores the high level of expertise and efficiency in the project planning, design, production and supply of industrial and decentralised steam and hot water production plants. Further boiler plants for biomass and pulverised lignite firing, waste heat boilers for gas and steam plants and thermal processes as well as numerous CONDORBOILERs for oil and gas firing are in the order books.